Known as “America’s favorite drive,” the Blue Ridge Parkway stretches for about 450 miles through portions of Virginia and North Carolina. 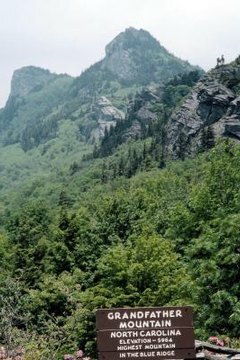 Mountain vistas and impressive coloration draw human visitors to the parkway, named for the Blue Ridge Mountains it traverses. Animals of all kinds live along the route, mammals, birds, reptiles and amphibians among them. Observing wildlife along the Blue Ridge Parkway is usually a positive experience, but it can present safety concerns. One of the most common dangers on the parkway is deer-and-automobile collisions. Be especially careful when traversing areas close to dense vegetation -- white-tailed deer are notorious for bursting from the forest with no warning as your car approaches. First they freeze, and they tend to lunge at the last moment. Deer usually travel at night and in groups; if you see one deer, be on the lookout for others in the immediate vicinity. While you will be safe from most wildlife while inside your car, it is important that you do not approach any wild animals seen at rest stops, scenic overlooks or similar areas. Along with a variety of small mammals, including commensal rodents, chipmunks (Tamias striatus) and grey squirrels (Sciurus carolinensis), you may observe a number of larger mammals when driving along the Blue Ridge Parkway. Virginia opossums (Didelphis virginiana) are among the most common mammals seen on and near the road, but cottontail rabbits (Sylvilagus sp. ), red foxes (Vulpes vulpes), white-tailed deer (Odocoileus virginianus) and coyotes (Canis latrans) may also approach or cross the road. Most mammal sightings occur at night, especially in areas where two different habitats meet, such as where agricultural fields are adjacent to forest. While a variety of song birds sometimes inhabit the forests and fields bordering the road, the most impressive birds seen along the parkway are red-tailed hawks (Buteo jamaicensis) and turkey vultures (Cathartes aura). Red-tailed hawks frequently perch on light posts and trees near the road while they scan for rodents and snakes on the ground below. Vultures are most obvious when circling en masse, high above the ground as they hone in on a carcass below them. Cars frequently hit screech owls (Megascops asio) as they hunt rodents along the roadside. Occasionally, you may see vultures or American crows (Corvus brachyrynchos) eating road kill on the side of the road, or wild turkeys (Meleagris gallopavo) moving and foraging along the side of the road. While not commonly seen high in the mountains, turtles frequently cross the road in places where the parkway borders a stream, lake or pond. Snapping turtles (Chelydra serpentina), slider turtles (Trachemys sp.) and painted turtles (Chrysemys picta) are some of the most commonly seen species. Box turtles (Terrapene carolina) cross roads bordering low-lying forests with regularity as is evidenced by the numerous road killed individuals that litter the road.Snakes fre quently cross the road and sometimes use the heat from the asphalt to warm their bodies after the sun goes down. Motorists commonly see black rat snakes (Pantherophis alleghaniensis) on the parkway, but northern copperheads (Agkistrodon contortrix mokasen) and timber rattlesnakes (Crotalus horridus) -- the two venomous species of the region -- sometimes traverse the roadway as well. When driving along the Blue Ridge Parkway in the rain, keep an eye out for frogs and toads hopping across the roadway. Grey tree frogs (Hyla versicolor), American toads (Bufo americanus) and leopard frogs (Rana pipiens) are common species in the area. In addition to hosting frog species, the Appalachian Mountains -- of which the Blue Ridge Mountains are a component -- harbor a higher diversity of salamanders than anywhere in the world. During or shortly after heavy rainfall, salamanders become active, moving to and from breeding or hibernation locations or foraging for food. Sometimes they cross roads, but their small size makes them difficult to see.